If you’ve played a FromSoftware game before you know that they’re usually rife with secrets and little optional things to find, and Sekiro: Shadows Die Twice is no different. There’s a ton of conspicuous items that don’t get explained unless you find where they’re used. 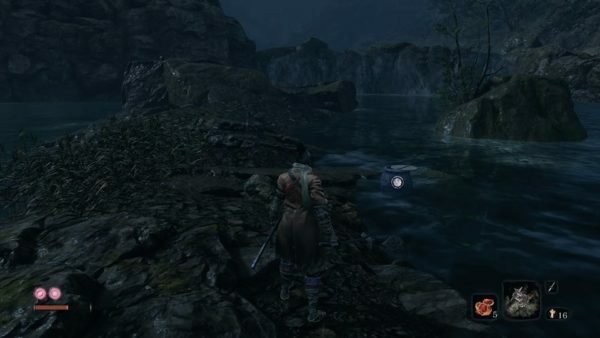 We’ll tell you about one such item, so here’s how to get Treasure Carp Scales and what they do in Sekiro. Before you can think about using Treasure Carp Scales you’ll need to find an item called the “Young Lord’s Bell Charm.” We have a full guide detailing how to find the item and use it, but basically you’ll get it in the first big area you explore after the opening, and using the charm opens up an entirely new area called the Harada Estate. It’s there that you’ll find the best place to get Treasure Carp Scales, and where to use them. Treasure Carp Scales are very rare items that you mainly get from killing Pink Carp enemies that swim in water. When you start at the Dragonspring in the Harada Estate area, head down to the little bridge and check the shore on the side closest to where you start to find one Treasure Scale, a freebie. After that, you’ll need to actually kill the fish to get more. When we played we found one fish swimming right underneath the bridge, another one past the bridge on the left, and then three more swimming around the little island that we’ll talk about next. It doesn’t seem like this is always what you’ll find there, however, as they’re fairly rare enemies, and upon returning to the area multiple times we were only able to find one more fish. There’s one more area to find a pink carp that we’ve found. As you follow the Estate Path through the area you’ll eventually come upon a split in the road, with a river heading up some cliffs and a path heading straight. Jump into the river and you’ll find another carp in the area, then you can head up the river to carry on. Once you enter the Harada Estate area, head straight to the bridge just down below your starting location. Instead of going across the bridge, jump into the water on the right side and swim straight ahead to a little island. On said island, you’ll find a strange little creature named Pot Noble Harunaga in a blue pot, just in the shallows of the water. By talking to this creature you can give it Treasure Scales in exchange for valuable items. There are four different items to buy, as you can see below. 5 Scales – Floating Passage Text – Unlocks the “Floating Passage” combat art, a powerful attack that hits multiple times. 7 Scales – Mast Fragment: Right – We aren’t sure what the purpose of this item is yet, but we’ll update his guide once we do. 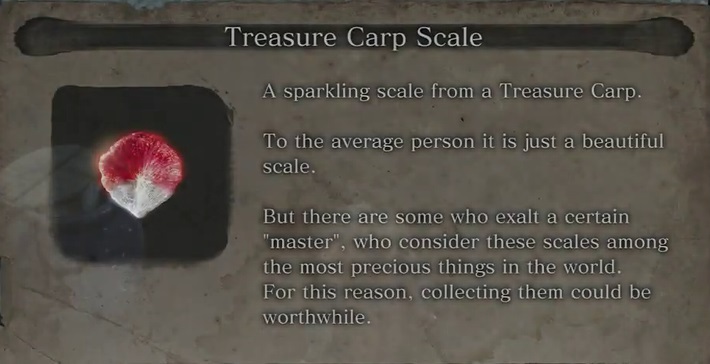 That’s everything you need to know about how to get Treasure Carp Scales in Sekiro. Make sure to search Twinfinite for plenty of other tips and info, or check out our extensive Sekiro guide wiki.